At Atlanta PT, we draw on our sports medicine experiences from working with both amateur and professional athletes of all ages. Our patients performance and fitness related goals are addressed by incorporating strength training and sport-specific activities into the performance enhancement plan. We look at the whole system to address an athlete’s asymmetries and identify weak links that may be affecting performance. Our therapists are trained in functional movement assessments, running analysis, the Pilates Method, as well as, the Redcord Neurac suspension training system which allows us to identify faulty movement patterns as well as compensatory strategies that hinder optimal performance. 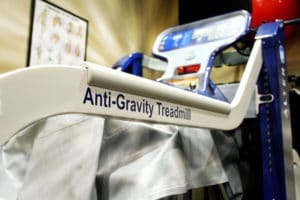 We also have an AlterG Anti-Gravity Treadmill that can provide up to 80% body weight support to help you achieve your fitness goals while training in a low impact environment.